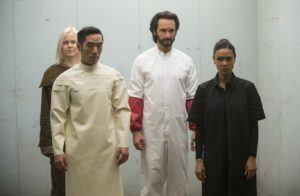 Ben and Wade finally find the centre of the maze in THE BICAMERAL MIND, Episode 10 of Season 1 in HBO’s TV series, WESTWORLD. Does Dr Ford’s plan make sense? The feeling of satisfaction, and letdown, when predictions come true. Is Charlotte actually Arnold’s son, Charlie? What happened to Elsie and Stubbs? Will Samurai World be the setting of Season 2? Can we see inspiration in THE LOST WORLD or PLANET OF THE APES for the next season of WESTWORLD? Maeve (Thandie Newton) has a plan!